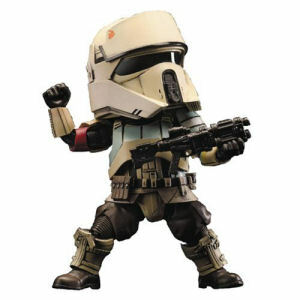 We have Just Sold out of Star Wars Rogue One Scarif Shoretrooper Egg Attack Action Figure - Previews Exclusive. This Item is unavailable at present. From the Star Wars Rogue One collection by Beast Kingdom. Star Wars Rogue One Scarif Shoretrooper Egg Attack Action Figure - Previews Exclusive. Storm Trooper features coastal sand equipment and an exclusive blaster pistol and rifle. Measures approximately 6 inches tall. Ages 15 and up. Beast Kingdom Star Wars Action Figures shipping from Canada. No Surprise Border fees or Customs!